The Gepids (Beowulf, Widsith)—possibly from Gibiðos, "givers" or gepanta, were an East Germanic tribe Gothic tribe most famous in history for defeating the Huns after the death of Attila. 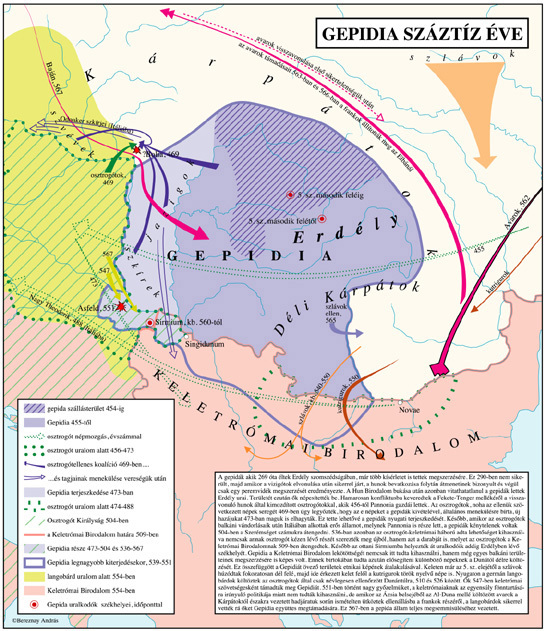 The state of the Gepids was commonly known as Gepidia or Kingdom of the Gepids, whose territory is composed of parts of modern day Romania, Hungary and Serbia. As early as 260 C.E. they invaded what was then the Roman Empire province of Dacia, together with the Goths. They later settled on the eastern bank of the Tisza river. They became vassals of the Hunnic Empire, forming the army's right-flank. After Attila's death, they joined the Ostrogoths in breaking up the empire for which they had previously fought. Next, after quarreling with their allies, they settled in the Carpathian Mountains. Tombs have been excavated dating up to the sixth century C.E. containing ceramics, bronze articles and armor. They were conquered by the Lombards in 567 C.E. The Gepids were almost certainly assimilated into the Romanian space, where many ethnic groups have mixed and mingled over the centuries, including Slavs, Germans, Greeks, Hungarians, Turks, Gypsies and Jews, among others. Often a buffer zone between rival powers, such as the Ottoman Empire and the Austro-Hungarian Empire, this space has known its share of conflict. Yet, despite centuries of division and foreign occupation, a rich culture emerged which blended East and West, creating a cultural bridge between rival civilizations. The legacy of the people of ancient Gepedia, and of their successors, the Romanians, suggests that while civilizational clash is one option, mutual enrichment and a developing consciousness that we are all members of a single human family, is another. You surely remember that in the beginning I said the Goths went forth from the bosom of the island of Scandza with Berig, their king, sailing in only three ships toward the hither shore of Ocean, namely to Gothiscandza. One of these three ships proved to be slower than the others, as is usually the case, and thus is said to have given the tribe their name, for in their language gepanta means slow (xvii.94-95). Eastern Hemisphere in 475 C.E., showing the Gepid Kingdom and its neighbors. The first settlement of the Gepids were at the mouth of the Vistula River, which runs south to north from the Polish Carpathian mountains. These Gepidae were then smitten by envy while they dwelt in the province of Spesis on an island surrounded by the shallow waters of the Vistula. This island they called, in the speech of their fathers, Gepedoios (perhaps Gibið-aujos, meaning "Gepid waterlands;" but it is now inhabited by the race of the Vividarii, since the Gepidae themselves have moved to better lands. Their first named king, Fastida, stirred up his quiet people to enlarge their boundaries by war and overwhelmed the Burgundians, almost annihilating them in the fourth century, then fruitlessly demanded of the Goths a portion of their territory, a demand which the Goths successfully repulsed in battle. Like the Goths, the Gepids were converted to Arian Christianity. In 375, they had to submit to the Huns along with their Ostrogoth overlords, becoming the favored Hun vassals. Under their king, Ardaric, Gepid warriors joined Attila the Hun's forces in the Battle of Chalons (the "Catalaunian fields") in Gaul (451). On the eve of the main encounter between allied hordes, the Gepids and Franks met each other, the latter fighting for the Romans and the former for the Huns, and seem to have fought one another to a standstill, with 15,000 dead reported by Jordanes, the main source for the events. Their forces formed the right-flank of Attila's army. …a most remarkable spectacle, where one might see the Goths fighting with pikes, the Gepidae raging with the sword, the Rugii breaking off the spears in their own wounds, the Suevi fighting on foot, the Huns with bows, the Alani drawing up a battle-line of heavy-armed and the Heruli of light-armed warriors. After the victory they finally won a place to settle in the Carpathian Mountains. The Gepidae by their own might won for themselves the territory of the Huns and ruled as victors over the extent of all Dacia, demanding of the Roman Empire nothing more than peace and an annual gift as a pledge of their friendly alliance. This the Emperor freely granted at the time, and to this day that race receives its customary gifts from the Roman Emperor. Not long after the battle at the Nedao the old rivalry between the Gepids and the Ostrogoths spurred up again and they were driven out of their homeland in 504 by Theodoric the Great. They reached the zenith of their power after 537, settling in the rich area around Belgrade. For a short time, the city of Sirmium was the center of the Gepid State and the king Cunimund minted golden coins in it. In 546 the Byzantine Empire allied themselves with the Lombards to expel the Gepids from this region. In 552 the Gepids suffered a disastrous defeat from Alboin in the Battle of Asfeld and were finally conquered by the Lombards in 567. Alboin had a drinking-cup made from the skull of Cunimund, which occasioned his death later in Italy, at the hands of an assassin sent by Rosamund, Cunimond's daughter. Many Gepids followed Alboin to Italy, but many remained. In 630, Theophylact Simocatta reported that the Byzantine Army entered the territory of the Avars and attacked a Gepid feast, capturing 30,000 Gepids (they met no Avars). Recent excavation by the Tisza River at Szolnok discovered a Gepid nobleman from an Avar period grave who was also wearing Turkic-Avar pieces next to the traditional Germanic clothes in which he was buried. Turda: The richest Germanic tomb found in Romania is here. The "Franziska" tomb was found in a Roman site and dated to the fifth century C.E. Gepid treasures were also found at Someşeni and Şimleul Silvaniei. The part of the world into which the Gepids are said to have "vanished" (modern Romania) remains a border zone between different cultures and civilizations where different ethnic groups have settled, mixing and mingling their heritages. Situated at a cultural and civilizational crossroads, this area became home to people of Slav, Saxon, Ukrainian, Roman, Gypsy Turkish, Magyar and German antecedents among other ethnicities. Often a football between larger imperial polities such as the Ottoman Empire and Austria-Hungary, civilizational conflict has frequently occurred. However, despite this, life at the local level often proceeded regardless of who was winning or losing on the battlefield. At the local level, people valued what they saw as useful or as beautiful in different cultures, and borrowed and adapted what they appreciated. This helped to create cultural bridge between rival civilizations. This legacy suggests that while civilizational clash is one option, mutual enrichment and a developing consciousness that we are all members of a single human family, is another. ↑ Jordanes and Charles C. Mierow trans.,Origins and Deeds of the Goths, Northvegr Foundation. Retrieved November 23, 2008. ↑ Jordanes (2007), section 96. ↑ Jordanes and Charles C. Mierow trans., Origins and Deeds of the Goths. l.261, Northvegr Foundation. Retrieved November 23, 2008. ↑ William A. Beckett, A Universal Biography: Including Scriptural, Classical and Mythological Memoirs, Together with Accounts of many Eminent Living Characters (London, UK: Mayhew, Isaac and Co., 1834), 99. ↑ Bela Köpeczi, Gepid Burial Grounds, History of Transylvania (New York, NY: Columbia University Press, ISBN 0880334797). Retrieved November 23, 2008. Köpeczi, Béla. 2001. History of Transylvania. Boulder, CO: Social Science Monographs. ISBN 9780880334792. Lázár, István. 1996. Transylvania, a short history. Safety Harbor, FL: Simon Publications. ISBN 9781931313216. Maas, Michael. 2005. The Cambridge companion to the Age of Justinian. Cambridge, UK: Cambridge University Press. ISBN 9780521817462. Mitchell, Stephen. 2007. 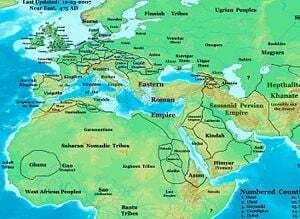 A History of the Later Roman Empire, AD 284-641: The Transformation of the Ancient World. Blackwell history of the ancient world. Malden, MA: Blackwell Pub. ISBN 9781405108577. Wolfram, Herwig. 1997. The Roman Empire and its Germanic Peoples. Berkeley, CA: University of California Press. ISBN 9780520085114. The kingdom of the Gepids. This page was last modified on 19 June 2017, at 18:21.